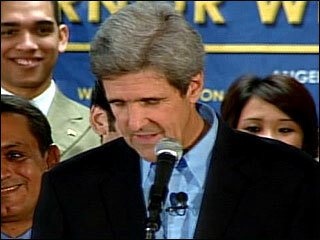 BAGHDAD, Iraq (CNN) -- U.S. troops showed their displeasure -- and sense of humor -- regarding Sen. John Kerry's comments this week to a group of California college students, whom he told to work hard in school or they'd "get stuck in Iraq." The "K" in "stuck" is written backward. Eight soldiers, who are stationed near the southeastern Iraqi city of Nasiriya, are shown holding the sign in a photo that has been widely distributed on the Internet. Radio host Charlie Sykes of WTMJ in Milwaukee, Wisconsin, takes credit for first posting the picture on his blog site, according to the New York Post, which ran a cover story on the photo Thursday. Sykes told the Post that he got the photo from a listener who had a friend in the Minnesota National Guard unit responsible for the sign. On his blog, Sykes explained why he posted the photo. "I posted it because it was a pretty clear indication that the troops pay attention to what they hear back home," Sykes wrote. "Kerry can try to spin this with political folks back home. But the picture suggests he'd have a tough time spinning it to the guys in Iraq." Speaking at a campaign rally Monday for California gubernatorial candidate Phil Angelides at Pasadena City College, Kerry said, "You know education, if you make the most of it, you study hard, you do your homework, and you make an effort to be smart, you can do well. If you don't, you get stuck in Iraq." Republicans and Democrats unleashed a firestorm of criticism on the senator, who hit back at his detractors saying he would not apologize for slamming the president and "his broken policy." Kerry reconsidered Wednesday, issuing an apology to troops for his "poorly stated joke" and saying his "words were misinterpreted." The White House quickly issued a response to the apology: "Sen. Kerry's apology to the troops for his insulting comments came late, but it was the right thing to do." Soldiers stationed at Tallil Airbase in southern Iraq have made a sign taking a jab at Sen. John Kerry.